Today's pattern started as a request on my Facebook page for a hooded premature burial cape. I figure I'd start small, as I'd never made one before and so this lovely little hooded cape will fit a bub of 18 weeks gestation. It is a very simple stitch pattern to remember, but it does take a while to make. Still, I think the delicateness of it is well worth the time it takes to make. 2: ch1, turn,in the first stitch (slst, ch3, 2dc), skip 2 stitches, *in the next stitch (slst, ch3, 2dc), skip the next 2 stitches* repeat across until the last stitch, sc in the last stitch. 3: ch1, turn, in the first sc, (slst, ch3, 2dc), *into the next ch3 space (sl st, ch3, 2dc)* repeat across to the last ch3 space, sc in the last ch3 space. End odd and weave in tails. Turn the cape so the first row is at the top and join your yarn, we'll work the next row in the same chains we started with. 28: ch1, turn, (sl st, ch3, 2dc) in the first stitch, skip 2 stitches, *in the next stitch (slst, ch3, 2dc), skip the next 2 stitches*, repeat across until the last stitch, sc in the last stitch. 29: ch1, turn, (slst, ch3, 2dc) into the first sc, *into the next ch3 space (sl st, ch3, 2dc)* repeat across to the last ch3 space, sc in the last ch3 space. 30: ch1, turn, in the first sc, (slst, ch3, 2dc), *into the next ch3 space (sl st, ch3, 2dc)* repeat across to the last ch3 space, sc in the last ch3 space. End off leaving a long tail. Using the tail, fold the hook in half and sew the seam up. Join yarn to the bottom corner of the cape and sc evenly up the opening, around the hood and back down the other side of the opening. End off and weave in tails. Chain 100 for a tie, weave the tie in and out of row 26 or 27. Today's pattern is the matching pants from last weeks post. Super easy to whip up, and like the jacket, will work for either gender. The legs of the pants are crocheted in continual rounds, so there are less joins visible. You will need to know how to complete the hdc5tg bobble. To make it, you simply hdc 5 together, but in the one stitch. Here is a quick rundown: yarn over, insert hook into the next stitch, pull yarn through (3 on hook), yarn over, insert hook into the same stitch, pull yarn through (5 on hook), yarn over, insert hook into the same stitch, pull yarn through (7 on hook), , yarn over, insert hook into the same stitch, pull yarn through (9 on hook), yarn over, insert hook into the same stitch, pull yarn through (11 on hook), yarn over, pull through all 11 loops. One bobble completed. 1: ch42, be careful not to twist, join. 4-10: ch2, hdc in each stitch around, join. 13-19: hdc in each stitch around (21) On round 19, after the last stitch, sl st one. 20: Join contrasting colour to the slst and ch2, *hdc in the first 2 stitches, bobble in the next* repeat around ending with a hdc, join. 21: Join main colour and ch2, hdc in each stitch around, join. Repeat rounds 12-21 for the second leg. To make a tie, chain 90 and weave tie in and out of the dc round. I'm going to be upfront here. I have a lovehate relationship with funfur (and other lashy/fluffy yarns) I love the colours they come in, and the soft squishiness of the finished piece and how utterly cute things made from it look. I hate how it is such a pain to use (even doubled with normal yarn) and how bits fly off and get stuck up my nose! It seems over the years I have collected a whole crate of the stuff, and I'd really like to use it up! So, here is a pattern for some. I don't know how many more I'll have, but hey, one is a start right? The trick to using funfurs, is to always hold them doubled with another solid plain yarn. It helps you find the stitches. Also, if you happen to miss a stitch, or come up with some extra ones, don't worry too much, funfur is very forgiving and you can't see any missed or extra stitches anyway! So todays pattern is actually something my girls helped me think up, and its a super cute little monster-thing. We have decided to call it Fuzzle (because it looks kind of like a chuzzle, have you played that? So much fun!) It is pretty easy to do, even with the fun fur! End off leaving a long tail but do not stuff the body just yet. Lightly stuff the feet and sew the opening closed but do not end off the yarn, you will need this to attach the feet to the body. Using some orange yarn stitch some toe marks into the feet. Position feet under the body and sew them on. This is why we didn't stuff the body, it is easier to get the feet on without it being stuffed. 2: 2sc in each stitch around, join. End leaving long tail. Make a second eye and sew the eyes onto the body. End off leaving a long tail. Make a second horn and attach them to the body. Stuff the body firmly and using the long tail, gather and sew closed the gap. yarn over, insert hook into the next stitch, pull yarn through (3 on hook), yarn over, insert hook into the same stitch, pull yarn through (5 on hook), yarn over, insert hook into the same stitch, pull yarn through (7 on hook), , yarn over, insert hook into the same stitch, pull yarn through (9 on hook), yarn over, insert hook into the same stitch, pull yarn through (11 on hook), yarn over, pull through all 11 loops. One bobble completed. This jacket will fit 28-30 weeks gestation. End off your main colour here and join contrasting colour. 14: sc around the entire edge of the jacket. Join your main yarn to any stitch on the arm hole. End off and weave in tail. Add buttons to the front of your jacket. Done! One super cute little jacket. This one also looks fantastic in more boyish colours. 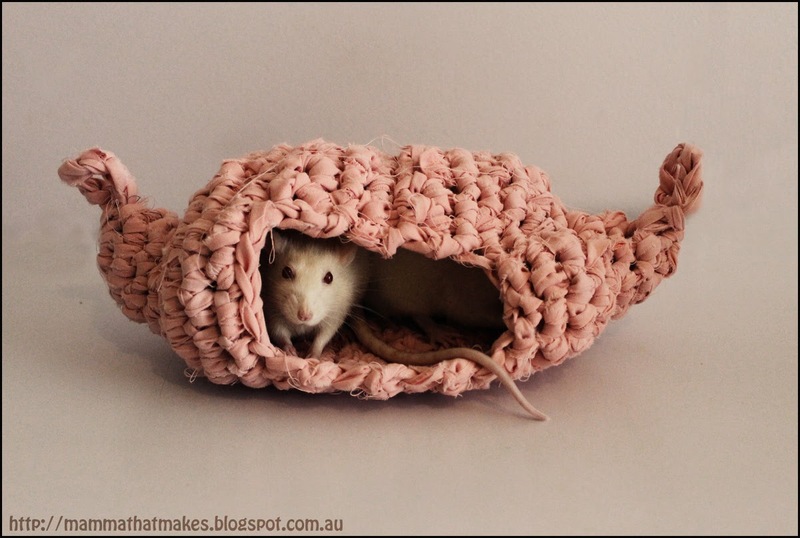 Today I have another pattern for another little rattie house! The last one was a big hit with my gals, however they chewed through the door so I decided it was time to make a new one. Ahh the joys of being a rat owner, they like to chomp on whatever décor you find for them hehehe! Im really having fun DIYing my cage out. We have all sorts of hammocks, liners, shelves and play things now! 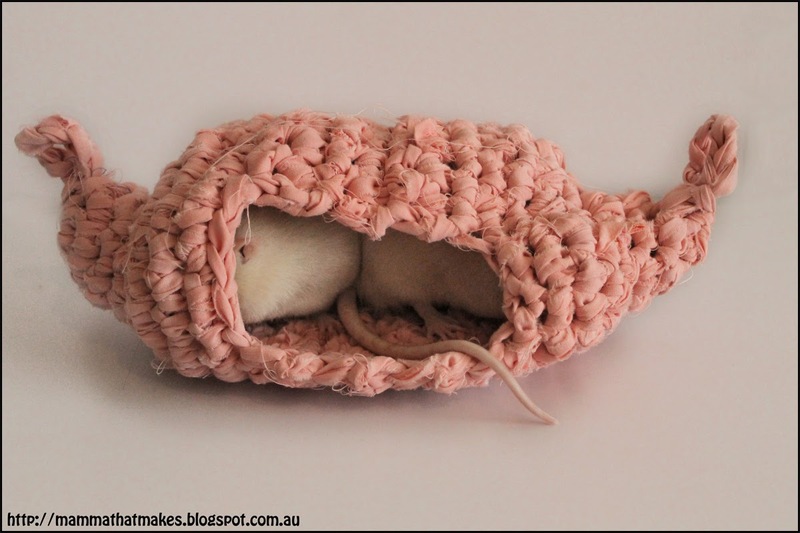 So today's rattie bed is kind of like two dome-ish shapes with a door in the middle. Its designed to be hung from each end. 1: ch2, sc into the 1st chain 6 times, do not join, chain 7, sl st back into the 1st chain, place marker. We've just created a loop for the bed to hang with. 2: *sc in the first stitch, 2sc in the next stitch* repeat twice, pull the loop forward and skip all the chains and the sl st, start the next round in the 1st sc from this round. 15: sc in the first 20 stitches, when you get to the opening chain 4, jump across the opening and sc to the 1st sc from this round, place marker. End off, using the tail of the fabric close the opening and sew tight. 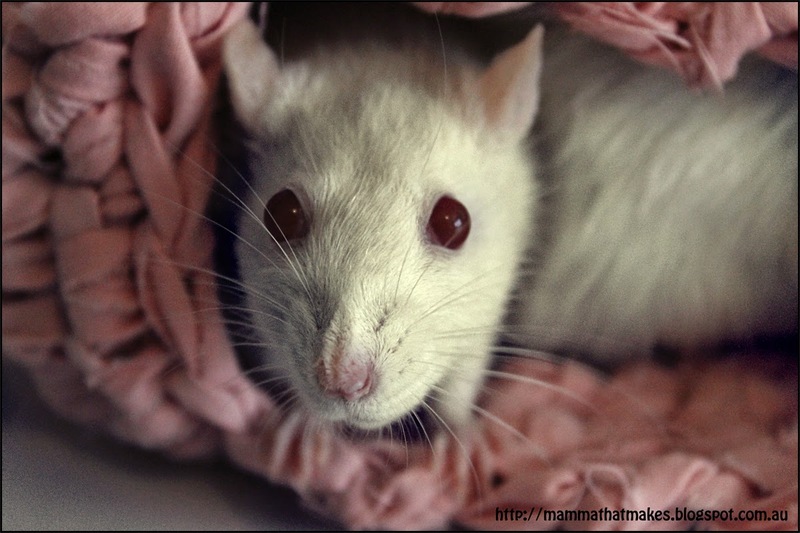 Your rattie bed is now ready to be hung.